10 Aug The "TSIMSHIAN SPIRIT" boat wrap hits the waves! When Calvin Helin (Canadian bestselling multi-award winning author, international speaker, entrepreneur, lawyer, and activist for self-reliance) approached Canawrap to wrap his boat in custom aboriginal artwork, the Canawrap team JUMPED at the opportunity! The artwork was custom created and submitted by Calvin’s cousin Bill Helin (the incredibly GIFTED Canadian designer/artist/jeweler) and after some adjustments of placement and scale to fit the curvatures of the boat we were able to output and apply the custom boat wrap graphics package. 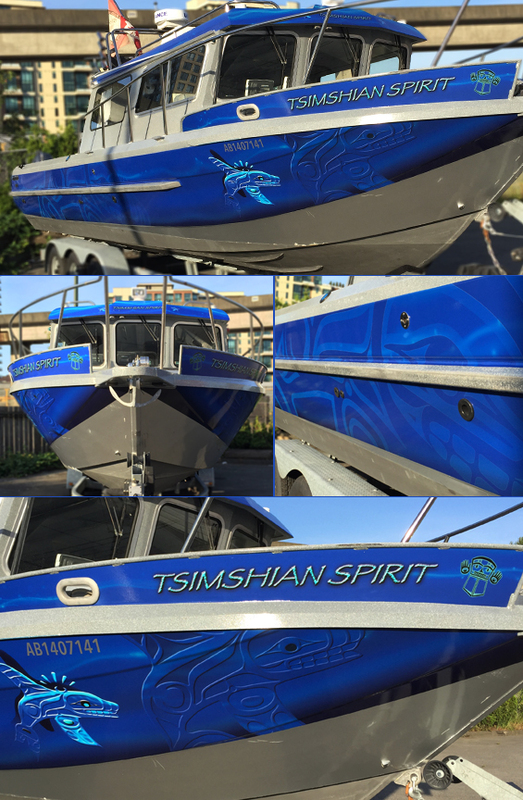 This custom boat wrap the “TSIMSHIAN SPIRIT” boasts vibrant colours, beautiful custom artwork and is skillfully applied to create a true show stopper! Thank you to Calvin and Bill for the opportunity to get YOUR message moving!